Yesterday we had our third day in Basel. Interesting meetings with Chronoswiss (more coverage later on) and a few of the Horomundi people. We rounded up with a nice diner with Kees Engelbarts (Cornelius & Cie), Bart and Tim Gr?ɬ?nefeld, Ben (Hodinkee), Frank (Monochrome), Gerard (Horloge.com) and few others. Click here to see a few pictures over at the Fratello Forum! 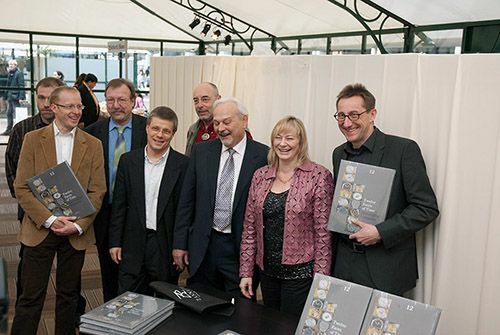 Above is a picture of the book signing session of Twelve Faces of Time, by Elizabeth Doerr and Ralf Baumgarten.